COMMUNITY APPRECIATION WEEK (September 17 – September 23). IF PAIN IS STOPPING YOU FROM DOING THE ACTIVITIES IN LIFE THAT YOU LOVE TO DO, AND YOU WANT TO GET YOUR LIFE BACK, then this offer is just for you! My office is doing something we have never done before. WE ARE offering 25 VOUCHERS TO CELEBRATE 25 YEARS SERVING OUR COMMUNITY. 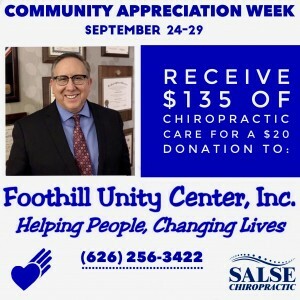 It’s called “COMMUNITY APPRECIATION WEEK” and it’s our way of saying “Thank You” to everyone in the San Gabriel Valley who has supported our on-going mission to help others. What does this offer include? EVERYTHING! Your package begins with a consultation and examination followed by a Report of Findings and your Treatment the following day. * Blog and Newsletter Subscribers Only: Print the coupon on our website and you will automatically receive a half hour massage from Guillian or Tabitha. A $40 extra value. PS: If you have not been to our office for a while, you’re in for a surprise. A wonderful new staff, new decor, and new equipment. 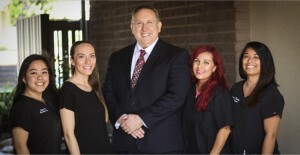 If you’re an old patient of Dr. Salse, stop by and say “Hi”, and take advantage of this special offer. We look forward to seeing you soon!